What can you say about today’s villains? Not much, apparently. There’s nobody who can hold a candle to Lady Macbeth, Ebenezer Scrooge, Professor Moriarty, or Dr. Fu Manchu. According to Nathaniel Nero (aka the Architect), the problem with villains today was their lack of imagination. Nobody wanted to build a lair on the bottom of the ocean or a space station on the moon. “I blame video games,” he said shaking his head dismissively. These days, everybody was too distracted by double-crosses, betrayal, and squabbling (and video games) to actually get anything done. Who has time to hatch an exquisitely mad scheme when you have the Avengers breathing down your neck? Just cut a hole in the sky and hope for the best. Despite the Architect’s supercilious attitude, the members of G.L.O.V.E. were doing their best to keep things interesting. The Global League of Villainous Enterprises actually built a prep school inside an active volcano. That’s pretty cool. And by doing so, they were paving the way for the next generation of supervillains (see our review of H.I.V.E. : The Higher Institute of Villainous Education for more information). Video games, we’re guessing, were not part of the curriculum. But if you’re a bad guy, double-crosses, betrayals, and squabbling were a big part of the job description. It was unavoidable, especially when the underworld was overflowing with fierce and long-standing rivalries. Like G.L.O.V.E., Anastasia Furan and her Disciples had their own academy for nascent villains. The Glasshouse had a reputation for producing a string of young and efficient assassins over the years. The school’s most infamous alumna was Raven, a young woman who could list “world’s most deadly assassin” on her resume. For new readers, Raven’s history was strikingly similar to the Black Widow, Marvel Comics’ sleek superspy. Naturally, graduates of the Glasshouse and H.I.V.E. were going to tangle. Just like Ohio State and Michigan, the animosity between the two schools was epic. The Glasshouse, however, had recently discovered an individual who could help defeat its nemesis once and for all. His name was Zero. Zero was a carbon copy of Otto Malpense, the star pupil at H.I.V.E. The only difference was that he was “faster, stronger, cleverer, and more superior in every way.” Like Otto, he was tainted by the influence of a crazy, megalomaniacal supercomputer named Overlord. But unlike Otto, there were no redeeming qualities about him. “Like father like son,” he hissed. Zero may not have been as sharp as his petaflop progenitor. But he definitely threw a monkey wrench into the ongoing Glasshouse/H.I.V.E. rivalry. “I am the next step in human evolution,” he said during his prerequisite end-of-novel soliloquy. “There will come a time when the whole world will kneel before me.” We’ll give you one guess how things turn out when the two teenage supercomputers eventually interface. As his name implies, Otto 2.0 was a big fat zero. Time to reboot. 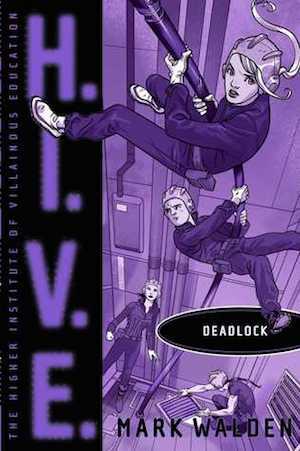 This entry was posted in Published in 2015 and tagged Deadlock, H.I.V.E., Mark Walden. Bookmark the permalink.